Here are the video results from the Bates Tech Balsa Wood Bridge Competition 2011. This simple video footage of the competition makes for a good learning opportunity. 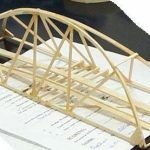 This video includes a variety of designs that are interesting to observe if you are looking to build a balsa wood bridge. Music video for the song, The Bridge Builder Blues written and recorded by Garrett and Drew Boon. 34 queries in 0.438 seconds.